Healthy, luxurious home essentials at honest prices, handcrafted just for you, made in California and shipped to your doorstep. Brentwood Home is committed to create the most comfortable and most natural sleep products as possible to give you your best night's sleep. 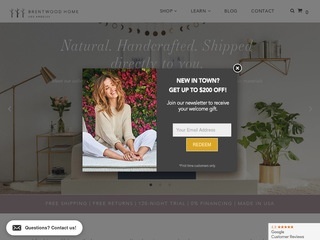 Know any brentwoodhome.com coupon code/deal not listed here? Please post it & share! $175 OFF SELECT MATTRESSES USE CODE “WAVES175” For a limited time, save $175 off our handcrafted, non-toxic luxury Oceano, Crystal Cove and Cedar Natural Luxe mattresses. Offers cannot be combined. Ends April 15. 20% OFF PET BEDS USE CODE “PETBED20” Our best selling Runyon and Griffith pet beds are on sale for 20% off while supplies last. Plus, enjoy free shipping & free returns. While supplies last. Offers can’t be combined. 20% OFF CRYSTAL COVE YOGA COLLECTION USE CODE “YOGA20” Enjoy 20% off our best selling Crystal Cove Yoga Collection pillows plus get free shipping & free returns. Offers cannot be combined. Excludes Crystal Cove Yoga Bundle. Ends March 18th. $175 OFF SELECT MATTRESSES USE CODE “WAVES175” For a limited time, save $175 off our handcrafted, non-toxic luxury Oceano, Crystal Cove and Cedar mattresses. Offers cannot be combined. Ends March 18th. Note: Any brentwoodhome.com coupon codes and deals listed on these pages may have expired or be invalid. Where possible we have listed the expiry dates we believe apply, but these dates are not guaranteed to be accurate.